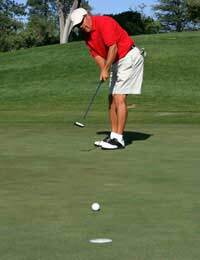 Golfing holidays are about enjoying the game in a stimulating and fresh environment. They are also about relaxation. There are none of the usual fellow club members around ready to gloat if you use one too many balls during your round, or end up finding the water. If you’ve travelled solo in golfing terms, rather than tagging along with the usual guys and gals, then there’ll be no pressure to compete against them for the bragging rights once you return home. Unfortunately, this sense of wellbeing, the chilled out approach then means you feel less tight and better able to execute your shots, this will go out of the window should you lose your sense of perspective and book a package that includes a course beyond your ability. Why do players do this? Overambition is usually the answer. If your annual vacation budget allows for one golf break a year, then the temptation is to opt for one of the big hitters - St Andrews, for example, or the Belfry. Alternatively, it may be a case of just wanting to walk in the footsteps of your heroes, perhaps hoping they may have dropped a little stardust along the way that will be picked up by your clubs. Dealing with these two temptations in reverse order, the latter is much less damaging to the ego. After all, you are not hoping to recreate a moment of golfing history by emulating a particular approach shot or monster putt, you simply want to experience the same challenge as the great players. If on the other hand, we are dealing with overambition, then frayed tempers, both your own and your non-playing companions, will be the result. Even golfers who have reached a respectable standard are going to find it difficult handling a course designed to test the very best; and heaven help those who don’t just want to play well, but turn up hoping to go round in less shots than one of the greats. Face it, it’s just not going to happen. View your break as a holiday with some golf thrown in; not the other way round. If you are determined to return a better player, then choose a package that has lessons or the option for lessons by the club pro included. This thirst for golfing knowledge can be taken a step further by booking a package at a school or academy that will offer a week-long curriculum designed to take your game to the next level. As well as intermediate and advanced classes, it is likely that beginners will also be catered for, offering a friend or partner new to the game the chance to tag along without feeling they’ve been left in the clubhouse while you have all the fun. If nothing else deters you from trying to take on one of the big courses, then think of the money. Why pay hard earned cash simply to come home feeling frustrated and deflated? We all want to be Tiger Woods, Ernie Els or Padraig Harrington. But even those guys take a day off once in a while. So follow their example, take the pressure off yourself and enjoy the game simply for the joy of playing. Then you’ll be in a much better mood to enjoy the après-golf at the hotel restaurant or beachfront bar.